1968 The 1968 Mustang Bullitt was a Highland Green 1968 Mustang GT fastback used in the 1968 movie Bullitt starring Steve McQueen. It is a significant movie due one of the best car chase scenes ever filmed. The popularity of this movie has inspired many 1968 Mustang owners to create their own versions. You basically take a 1968 GT Mustang, paint it Highland Green and add American Racing Torque Thrust wheels. 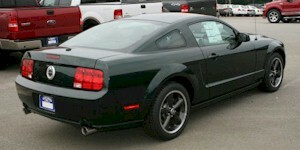 In 2001 Ford created their own Highland Green (avail in black too) Mustang Bullitt special model. They did it again in 2008 and 2009. 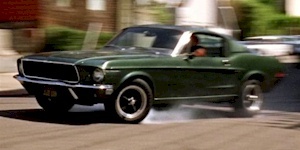 2001 The 2001 Bullitt optioned Mustang was based on the 1968 fastback driven by Steve McQueen in the detective movie Bullitt. Bullitt modifications include unique side scoops, 17-inch American Racing aluminum wheels, a lowered suspension, modified C-pillars, special quarter panel molding, rocker panel moldings, brushed aluminum fuel cap door, special Bullitt badging, polished-rolled tailpipe, and came in Dark Highland Green and True Blue and Black. The original 1968 used in the movie was Dark Highland Green. The movie's director called for speeds of 75 to 80 mph, but the cars (including the ones containing the cameras) reached speeds of over 110 mph on surface streets. Filming of the chase scene took three weeks, resulting in 9 minutes and 42 seconds of film. During the chase scene, the Charger loses six hubcaps and has different ones missing at different times. The production company was denied permission to film on the Golden Gate Bridge. 2008 The 2008 Mustang Bullitt brings back the style of the 1968 Mustang fastback used in the 1968 Steve McQueen movie Bullitt. 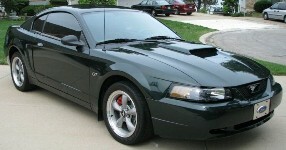 Available in Highland Green (unique to Bullitt) or Black exterior paint, this special model includes modified 18-inch micro machined Euro-flange Bullitt wheels with a satin finish; tri-bar pony wheel caps; dark gray painted calipers; satin finish Bullitt emblems/badging; 3.5 inch stainless steel packed exhaust tips; ram air and other improvements added to the 4.6 liter, 3-valve, single-overhead cam, V8 engine; and special handling. Production will be limited to 7000 units. 2009 The 2009 Mustang Bullitt brings back the style of the 1968 Mustang fastback used in the 1968 Steve McQueen movie Bullitt. Available in either Highland Green (unique to Bullitt) or Black exterior paint choices. Standard options on this special model include modified 18-inch micro machined Euro-flange Bullitt wheels with a satin finish; tri-bar pony wheel caps; dark gray painted calipers; satin finish Bullitt emblems/badging; 3.5 inch stainless steel packed exhaust tips; ram air and other improvements added to the 4.6 liter, 3-valve, single-overhead cam, V8 engine; and special handling. 2019 The 2019 Mustang Bullitt is a limited special edition featuring a 475hp 5.0L V8, special dark green paint or black, 19 inch black wheels with Brembo brakes, blank front grille with thin chrome surround trim, thin chrome window trim, and Bullitt badges inside and out. Optional black leather Recaro seats are also available.